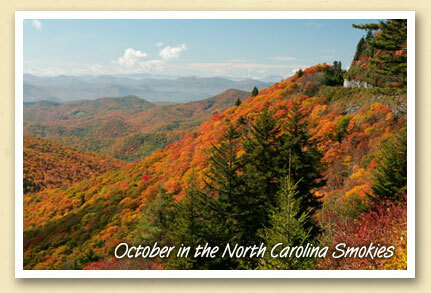 Postcards From The Smokies » Autumn’s Annual Guessing Game — When is “Peak” Leaf Season? Autumn’s Annual Guessing Game — When is “Peak” Leaf Season? Fall visitors to the Smokies often try to plan their visit around the “peak season” for autumn color. Yet no one except Mother Nature knows when the “peak” will occur …and she’s not talking. Fall arrives first at the higher elevations, suggesting early-to-mid October drives along the Blue Ridge Parkway (above), Cherohala Skyway, and US 441 across Newfound Gap. Yet at the lower elevations around Bryson City, the best color usually arrives mid-to-late October …sometimes as late as early November. Truth is, if you visit the Smokies just about any time in October, you’re certain to find Fall foliage. Just look high and low.